The top 30 and ties after Friday’s sixth and final round at PGA Golf de Catalunya will earn their tour cards but Kearney will need one of the rounds of his life to make it now as he sit on level par, nine shots outside the top 30 and ties. Conditions were perfect for scoring at the 7,205 yard Stadium Course - cool, windless and overcast - but it was still impressive to see 45 of the 70 survivors shooting level par or better. 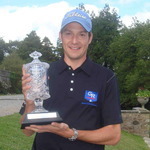 But Kearney wasn’t among them as he mixed three birdies and three bogeys with a brace of expensive double bogeys in a four over par effort. “I’ve had five double bogeys in the last two days and that’s mainly been down to driving the ball poorly,” Kearney said. “But I’ll have a full Challenge Tour card next year, which is what I had this year before I had the operation. I’ll just go out tomorrow and give it a rip and see what happens. England’s Simon Wakefield shot a 67 and Spain’s Carlos del Moral a seven under 65 to lead by a shot on 16 under with 35 players at nine-under or better. 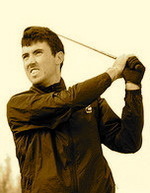 But Kearney got off to a terrible start, following a bogey at his second hole (the 11th) with a double bogey six at the 14th where he drove behind a tree, chipped out sideways but then bunkered his third and failed to get up and down. He recovered some ground with a two-putt birdie at the par-five 15th and another shot at the first, where he holed a 10 footer for birdie. But having failed to birdie the par-five third after another drive into the trees forced him to lay up, he three-putted the fourth for a bogey, missing a three footer for his four, and the found water with his four-iron tee shot at the 209-yard fifth, racking up his fifth double bogey of the week. Four over for the round, he knew it wasn’t going to be his day when his nine iron approach to the 410-yard sixth spun back towards the hole and narrowly failed to drop for an eagle two. Thoroughly deflated, it was no surprise that he failed get up and down for par from right of the ninth green. 356 Niall Kearney (Irl) 76 65 67 72 76; J Robinson (Eng) 69 73 66 73 75. 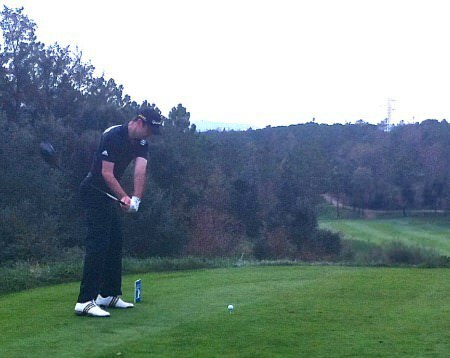 Niall Kearney brilliantly chipped in for a late eagle three to keep his European Tour dream alive at the Qualifying School finals at PGA Golf de Catalunya.